(AFP) - Pope Francis vowed Thursday to seek deeper "unity" between the Catholic Church and other Christian faiths as he arrived in Geneva, a centre of Protestantism, amid Christianity's waning influence in Europe. Francis touched down in Geneva, the home of French Protestant reformist Jean Calvin, shortly after 10:00 am (0800 GMT), and was met by Swiss President Alain Berset and other government ministers. 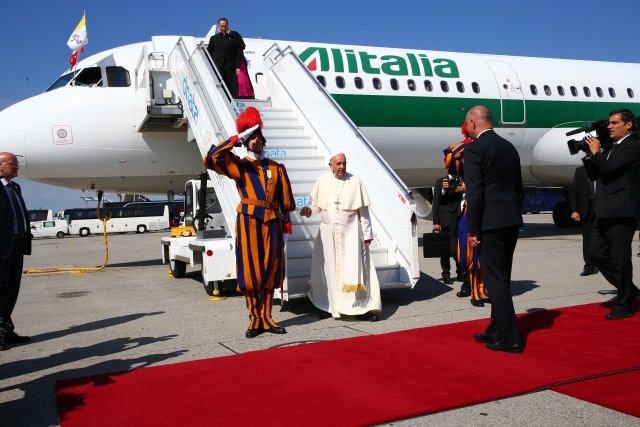 "This is a trip towards unity," the pontiff told reporters on the plane before landing. He came at the invitation of the World Council of Churches (WCC), which was created in 1948 and groups 350 Protestant, Orthodox and Anglican churches from more than 100 countries around the world, with around half a billion believers among them. During his visit he will take part in an "ecumenical prayer" for the organisation's 70th anniversary, highlighting his commitment to unity between various Christian denominations. He will also celebrate Mass in front of tens of thousands of Catholics at the city's Palexpo convention centre. The Catholic Church is not part of the WCC but Francis is keen to close the gap between its 1.3 billion-strong faithful and the Churches under the WCC umbrella, in particular given the regularity of deadly attacks on Christians. In December nine people were shot dead by a gunman who opened fire at a Coptic Christian church in Cairo in an attack claimed by the Islamic State group (IS). In April, Egypt sentenced 36 people to death for their role in a string of bomb attacks on Coptic churches in Cairo, Alexandria and the Nile Delta city of Tanta between 2016 and 2017 that killed at least 80 people. The pontiff has at times faced criticism for making ecumenism and interreligious dialogue -- most notably with Muslims -- one of the priorities of his pontificate. He has frequently referred to "ecumenism of blood", deploring the indiscriminate murder of Catholics, Orthodox and Protestant Christians. "If the enemy unites us in death, who are we to be divided in life?" Francis asked in 2015. In October Francis took part in the event celebrating the 500th anniversary of the Protestant Reformation started by Martin Luther, which led to bloody conflicts between Catholics and Protestants across Europe. The proximity of the pope to a very modern Lutheran Church (led by a married woman and with two openly homosexual bishops) and the Russian Orthodox Church has however raised eyebrows in conservative circles of the Catholic Church. In February 2016, the pope and Patriarch Kirill of Moscow, the head of the Russia Orthodox Church made a historic step towards Christian unity following the first-ever meeting between the leaders of the two largest single Christian denominations -- held in Cuba -- since their split in 1054, known as the "Great Schism". The pair signed the Havana Declaration, which called for an end to Islamist abuses against Christians in the Middle East. But the agreement with the Moscow Church, which leads more than 130 million of the world's 250 million Orthodox Christians, had been criticised by Greek-Catholic Ukrainians who felt betrayed by the pope.